Hampers make great, thoughtful Christmas presents and are ideal to give to family members. Although there are loads of ready made hampers available to buy, these always seem a little bit uninspiring and naff to me! I much prefer the idea of putting together your own hamper using unique products and treats of your choosing. 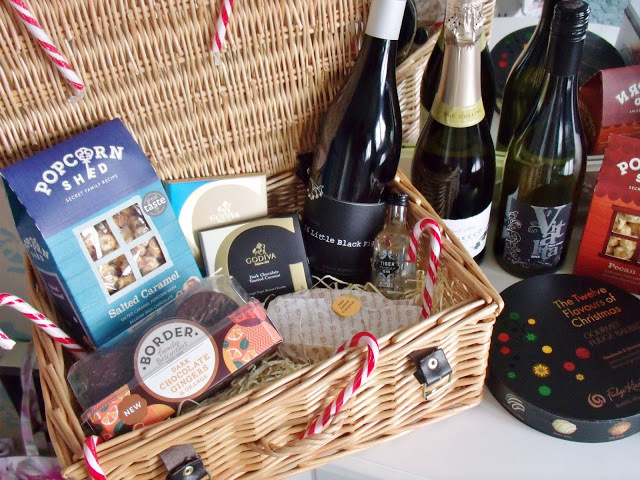 You could also theme your hamper: retro sweets, crackers and cheese, chocolate, alcohol! 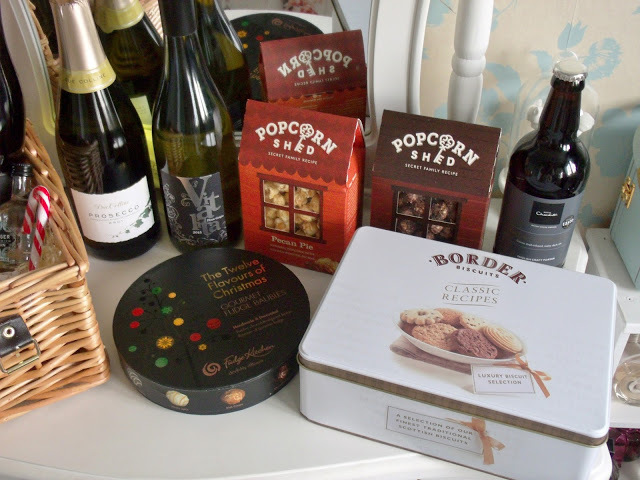 But this hamper that I’ve put together includes plenty of sweet treats such as popcorn, chocolate, and fudge! Yummy! Making a hamper is really easy. All you need to do is find a wicker basket or hamper or even a crate to put everything in. Then you can use some shredded paper or pretty tissue to line the container. You can actually buy DIY hamper kits from HobbyCraft which include everything you need to create one. Next.. fill it with goodies! 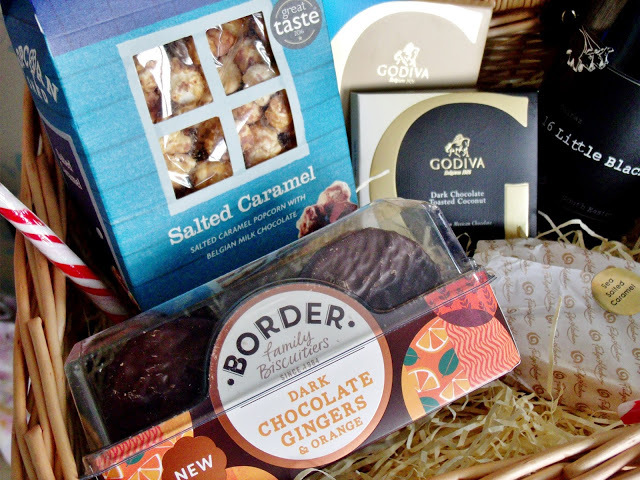 My hamper includes lots of delicious sweet things which I plan on indulging on from Christmas Day up until New Years (if they last that long!). 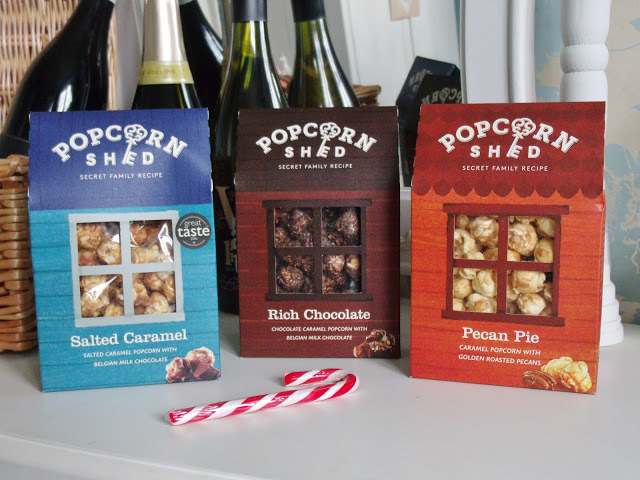 The award winning Popcorn Shed boxes will be perfect for feasting on whilst watching festive family films together. These come in three delicious flavours: salted caramel (my fav! ), rich chocolate, and pecan pie. Popcorn Shed products are made by hand, using all natural ingredients, free of any preservatives or additives, and are absolutely scrumptious! 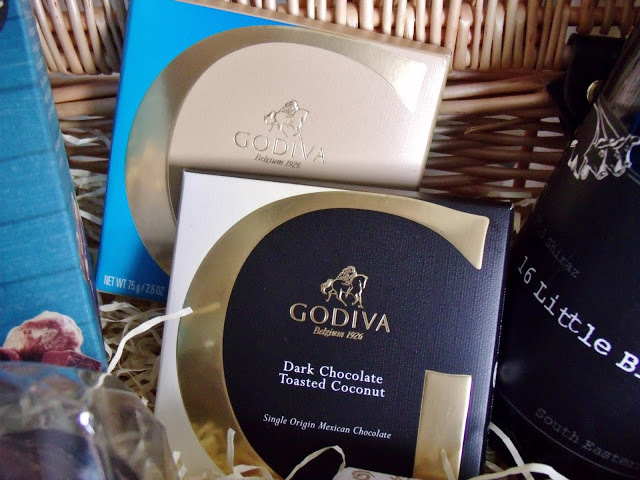 I don’t think any Christmas treat hamper would be complete without some chocolate.. it’s a must have! These little chocolate tablet bars from Godiva are the perfect size for packing into hampers and are also ideal for sharing. Each chocolate tablet contains the most delicious and highest quality ingredients and the chocolate is moulded into curved tiles and then wrapped in luxurious, gold-embossed paper. The tablets are available in 6 different flavours and I can highly recommend the Blond Chocolate Salted Caramel flavour. Next up.. fudge! 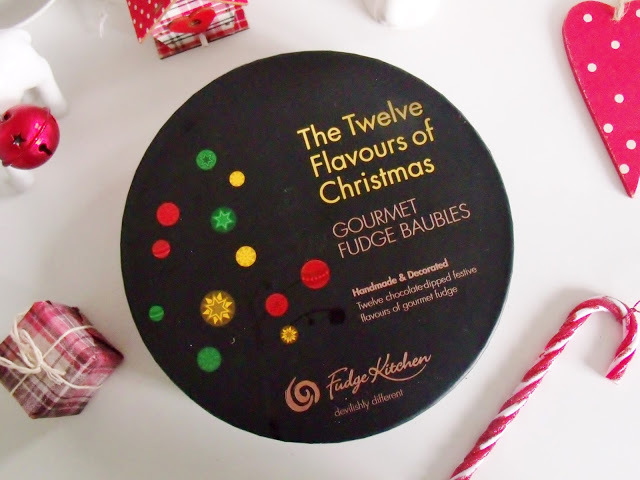 A classic Christmas treat, but these gourmet baubles from Fudge Kitchen have a unique twist. 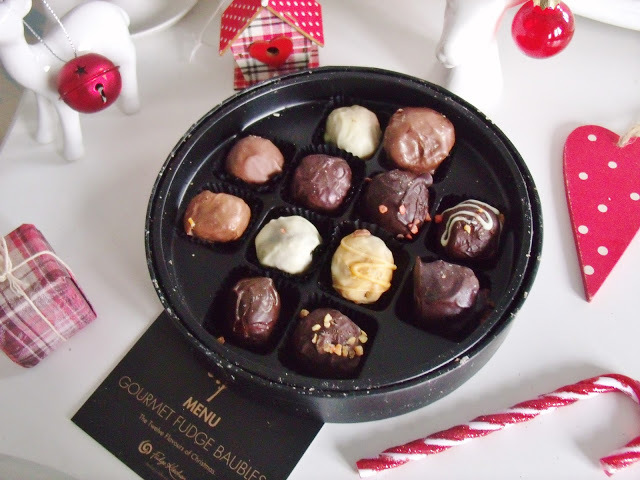 Twelve Flavours of Christmas box features 12 delicious, top selling seasonal fudge balls which have been hand rolled and decorated. Each one is dipped in delicious dark, milk or white silky, smooth chocolate. The baubles are all beautifully presented and the festive flavours include Christmas Cookie, Mince Pie, Chocolate Orange and Gingerbread. Fudge Kitchen also offer a range of fudge slices in various different flavours. These would be perfect to add to a treat hamper, and I absolutely love the Sea Salted Caramel fudge slice which is dairy free (plus it’s suitable for vegans too!). 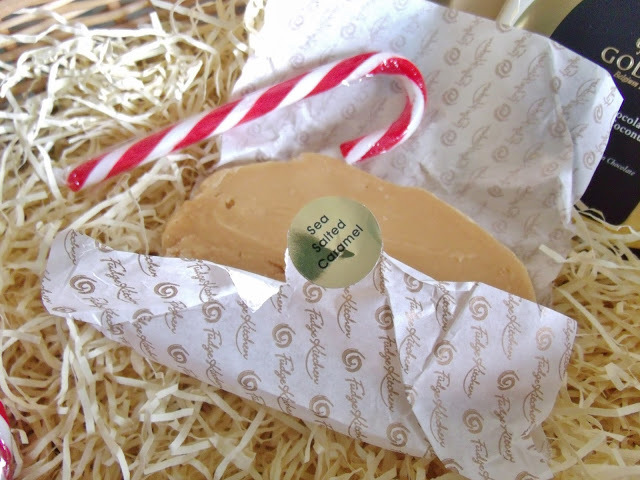 Made with soya milk and gooey caramel, it includes crunchy sea salt from The Anglesey Sea Salt Company which gives the fudge a sharp, yet delicious edge. The fudge has a firm outer crust, yet as you slice off a chunk – the soft and sumptuous inner is revealed! 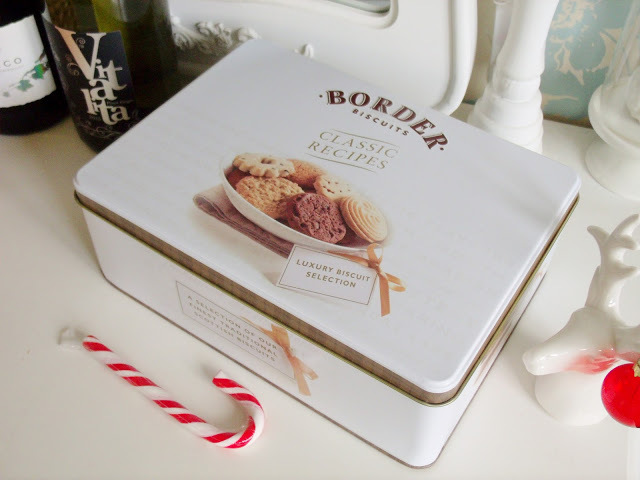 A classic biscuit selection like this tin from Border Biscuits is always a firm family favourite and are great for all kinds of get-togethers. You can’t beat a good quality luxury biscuit along with a nice up of tea at the end of a long day. This tin includes a range of the UK’s most popular biscuits including buttery viennese whirls, chocolatey cookies, sweet butterscotch biscuits, and choc chip shortbread rings. Or if you perhaps want to include something a bit different, you could try something like the delicious ginger biscuit selection. This pack contains three different flavours: dark chocolate, milk chocolate, and dark chocolate and orange. You can’t beat a crunchy ginger biscuit over Christmas! 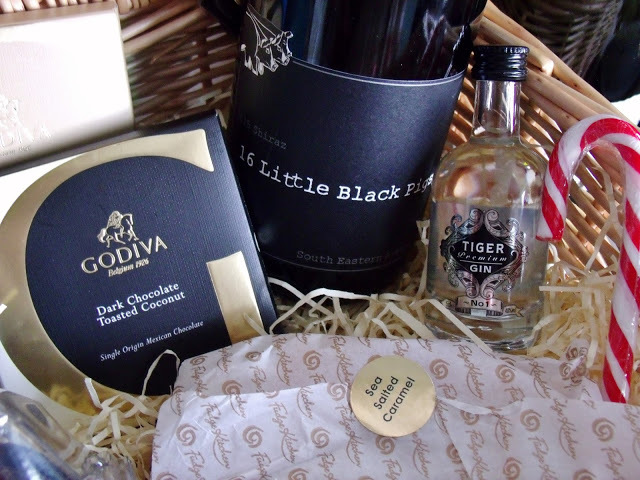 And last but not least.. what’s a Christmas hamper without a little tipple? Whatever your favourite drink is, you could include a full size or perhaps a miniature bottle in your festive hamper gift. 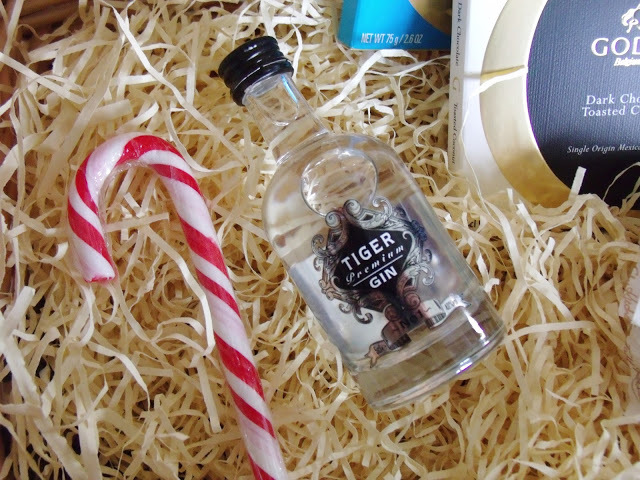 This little bottle of premium Tiger Gin is the perfect addition for anyone that enjoys a little G&T. Their gin has been crafted using the finest botanicals and spices to create a smooth and sweet flavour using all natural ingredients and no artificial flavourings. The Tiger Gin brand story is pretty interesting; they went to the high court after Heineken challenged the trademark, claiming it to be too similar to that of their Tiger Beer. But they didn’t give in and amazingly, the small company from Shropshire beat the big boys and Tiger Gin is now sold throughout the UK. Or perhaps a special bottle of wine or prosecco is suitable for the festive occasion? Virgin Wines sell an enormous range of wines at great prices, and best of all they can deliver straight to your door. Unlike supermarkets, they don’t stock the big name wines made in huge factories using mass produced techniques. Instead, they sell boutique quality wines produced by small independent winemakers. My hamper will be including a bottle of the Due Colline Prosecco, a 16 Little Black Pigs Shiraz, and my personal favourite, a classic Vitalita Pinot Grigio. 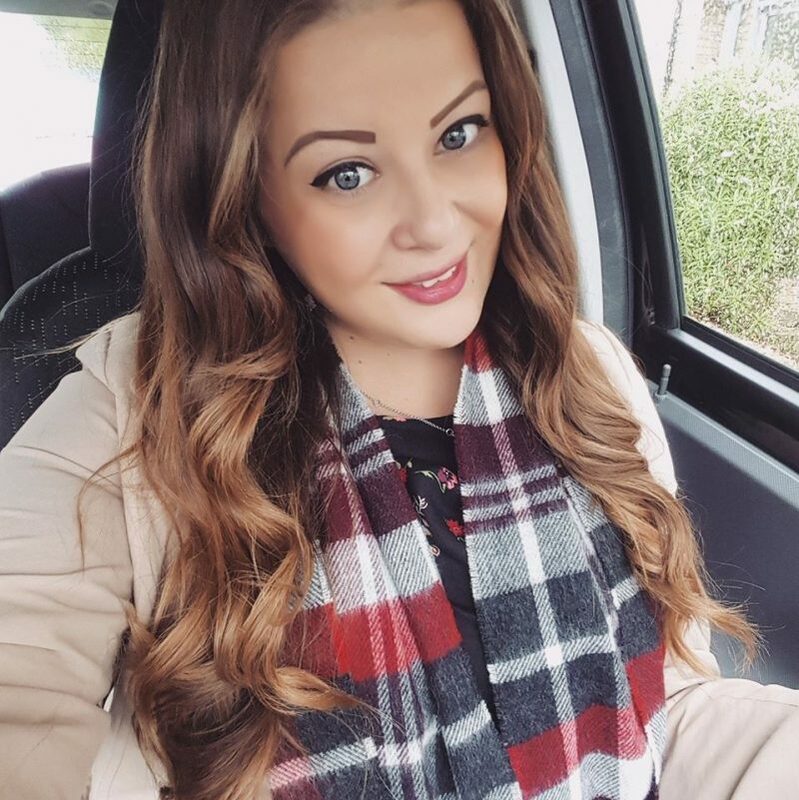 Once your festive hamper is full of delicious treats, you could also throw in some candy canes or colourful foil wrapped Christmas sweets and chocolates to add some colour. Then wrap the hamper with ribbon and add a pretty handmade gift tag. Ta-da! A DIY treat hamper complete and ready to be enjoyed by the whole family! That is a great idea. I was looking for such a cute ideas for Christmas gifts. Thank you for sharing your ideas here.